The Central Hockey League has conferred their player of the week honors on two Oilers in two consecutive weeks. Last week, rookie forward Adam Pleskach was the player of the week and on Monday 13-year veteran Michel Beausoleil was named the award’s recipient. Pleskach, who just signed with Tulsa on November 1, scored four goals and chipped in three assists in three Oilers victories last week. A rookie left winger, Pleskach entered the week with five points in his first three games as an Oiler and continued his production with a goal and two assists in Wednesday’s 4-0 triumph over Wichita. Friday, in Tulsa’s first ever meeting with St. Charles, Pleskach scored in the second period and provided the game-winning goal late in the third period to push the Oilers to a 6-4 win. The Beausejour, Manitoba native pushed his point streak to six games when he found the net again on Saturday in Tulsa’s 3-2 shootout victory over the Chill. This week, Pleskach and his linemates, Kyle Bochek and Brandon Coccimiglio, combined for 16 points (6 goals, 10 assists) and a collective +17 rating. In six games with Tulsa, the 6-foot-2, 210-pound Pleskach has recorded six goals and six assists. He leads the Oilers in points (12), game-winning goals (2), and has posted an impressive +8 rating. Pleskach, who spent four years at American International College, appeared in ten games last season for the Evansville Icemen (ECHL). In 16 professional appearances, Pleskach has put up 20 points. The 25-year old ranks second among all CHL rookies with 12 points and is tied for the rookie lead with a +8 rating. 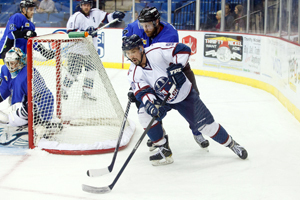 Beausoleil, in his 13th season as pro, scored four goals and chipped in two assists in three Tulsa victories last weekend. Friday night in Wichita, Beausoleil recorded a power play goal late in the second period and assisted on the game-tying goal early in the third period of Tulsa’s 7-4 comeback win over the Thunder. The Montreal native found the back of the net again on Saturday to help the Oilers pick up a 3-2 overtime win against the rival Thunder. Back on home ice on Sunday in the first ever meeting between the Oilers and Brampton Beast, the 33-year old Beausoleil tallied twice to push Tulsa to a 6-3 triumph. The 5-foot-10, 195-pound right wing posted his third multiple-point game of the season. With an empty net goal late in the third period on Sunday, Beausoleil became the fifth player in Oilers history to score 100 goals and moved into sole possession of sixth place on the Oilers all-time points list with 232. 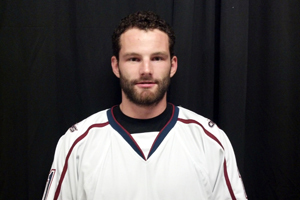 Beausoleil, in his sixth season with Tulsa, leads the Oilers with nine goals and a +9 rating. He has 685 points in 745 career games. Each player received a special gift from the award’s sponsor, Oakley Apparel. The Oilers will take a 7-6-2, 5th place record into Allen on Friday night, starting a three-game set with the defending CHL champions that will conclude with a 4:05pm matinee game in the BOK Center on Sunday afternoon. Tickets for that game and all remaining Oilers home games are available at the BOK Center Box Office downtown or at the Oilers office at 9128 E. 46th Street. This entry was posted in Sports on November 19, 2013 by admin.